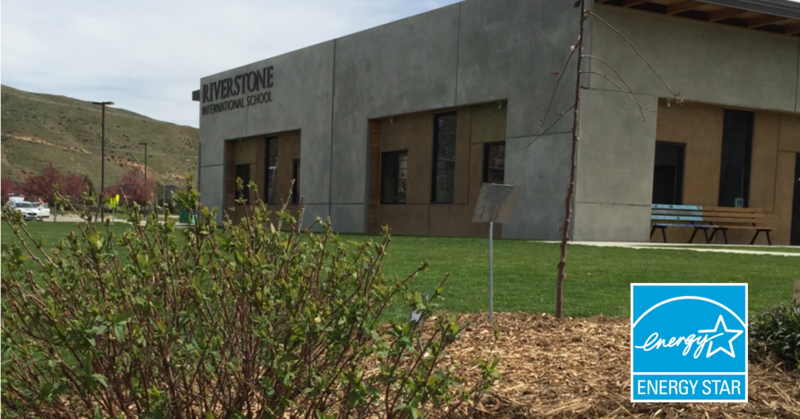 Riverstone is going even GREENER! We’re excited to announce that Riverstone International School’s elementary school building has earned EPA’s ENERGY STAR certification! This certifies that the elementary school building is achieving energy performance in the top 25 percent of similar buildings nationwide. Here’s to many more years of cutting energy waste, reducing greenhouse gas emissions and doing our part to protect the environment! What is even better than saving money by reducing energy use? What about saving money while improving the quality of our indoor environment and using fewer resources to reduce the natural capital needed to educate our youth? This is another proactive step taken by RIS to work towards achieving a Triple Bottom Line for management of the school. It is rewarding to see deliberate actions taken that improve our world and end with such positive results. Thank you to Riverstone’s Sustainability Coordinator Ben Brock and our energy management team, and a huge shout out to the University of Idaho Integrated Design Lab! Elizabeth Cooper and her team were indispensable throughout this process. I am excited to continue to improve our Energy Star score as we educate all our visitors and occupants on ways to help us save energy! We approached Elizabeth Cooper from the University of Idaho Integrated Design Lab (IDL) to ask for help with our gas, power and water meters and benchmarking the Riverstone campus in the Energy Star Portfolio Manager, with an ultimate goal of achieving Energy Star certification at any of the buildings that could qualify. After meeting with Elizabeth and the IDL team, we scheduled a site visit. We also invited Intermountain Gas and Idaho Power representatives. We walked the property and buildings to see the existing conditions, and discussed potential savings opportunities, strategies and incentives that would be available to the school for undertaking these projects. After that, it was time to crunch the data in the Energy Star Portfolio Manager to see where we stood with our energy use compared to other similar buildings in the U.S.
As we entered data into Portfolio Manager and generated scores for each building’s energy use in February 2016, we began to understand power use on campus and were able to implement the most accessible energy-saving strategies. The campus is broken into four main areas based on power meters: Elementary School, Gym, Middle School, and High School. The initial numbers from the High School showed that it was a lost cause, and since it is slated for replacement in Phase II of the RIS expansion we did not pursue savings there. The same was true for the HS portables that were slated for removal in Summer 2016, to be replaced by a purpose built building. The Elementary School, at that time the newest building on campus and the only purpose-built structure, had the best initial benchmark rating. We also learned that there was room for improvement at the Gym, where we were able to make significant gains by simply turning off the lights at night – with many more ideas in the wings! At the Elementary School we tackled HVAC first since there were Idaho Power incentives available. We tightened air circulation and realized great savings during the winter of 2016. Unfortunately (fortunately?) in 2017 as we conducted the official building audit for EnergyStar certification, we learned that we had reduced the air exchanges too much and the building was collecting far too much CO2. With the realization that our indoor air quality was not ideal for a working or learning environment, we started to look for the balance between air exchanges and energy efficiency. The Energy Star journey has done much more than save Riverstone money on utility use – it helped us create a better environment for students, parents, teachers, staff and administrators at Riverstone. While this is harder to measure, it is arguably more important than the money we are saving!